Originally uploaded by Debbie Davies. 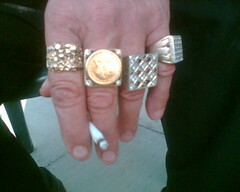 Debbie just sent me this picture – she was working on a TV show yesterday and spent some time with this bling-bling guy . Answers on a postcard please on what kind of person owns a hand like this. I was going to say Mike Skinner or one of those GLC boys, but the fingers look a bit chubbier than any of those, so I’m going to go with Shaun Ryder (or similar).